to other L-methylfolate supplements on the market. 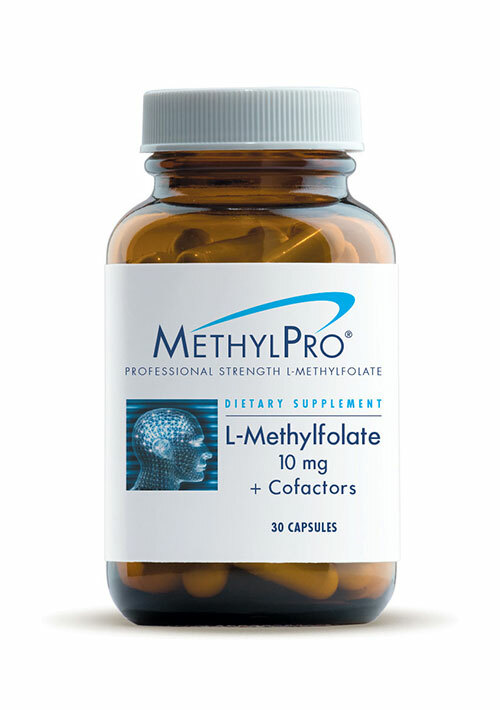 MethylPro® is a high quality, professional strength L-methylfolate supplement that presents better value and purity, than other L-methylfolate products on the market. Like all other supplements manufactured by Metabolic Maintenance, MethylPro® contains no preservatives, no added excipients, fillers, or binders. The capsules are vegetarian. Glass bottles maximize the potency of the nutritional product and eliminate toxins such as dioxins and bisphenol-A (BPA), found in plastics. Unlike other products on the market, MethylPro® is hypoallergenic; it’s free of gluten, soy, dairy, stevia, peanuts, and tree nuts. Take a look at the ingredients in Deplin® and notice that it contains many unnecessary ingredients, including allergens like milk and soy. Ingredient list for DEPLIN® 15: Silicified Microcrystalline Cellulose, Algae-S Powder (Schizochytrium Algal Oil [vegetable source], Glucose Syrup Solids, Mannitol, Sodium Caseinate (milk), Soy Protein, High Oleic Sunflower Oil, 2% or less Sodium Ascorbate, Tricalcium Phosphate, Tetrasodium Diphosphate, Natural Flavors, Soy Lecithin, and Mixed Natural Tocopherols and Ascorbyl Palmitate, Pullulan, L-methylfolate Calcium, Titanium Dioxide [color], Magnesium Stearate (vegetable source) FD&C Yellow #6[color], FD&C Red #40[color], Propylene Glycol, Sodium Hydroxide, Povidone, Shellac. Contains Milk and Soy. Not all supplements labeled as methylfolate are the same. There are a few things to consider when you are buying a high quality L-methylfolate supplement. Pick a high-quality form of L-methylfolate (calcium or glucosamine salt). Look at the label for the 6(S) isomer or L-5-Methylfolate. Avoid labels that say 6(R), D-5-Methylfolate, or that don’t specify. 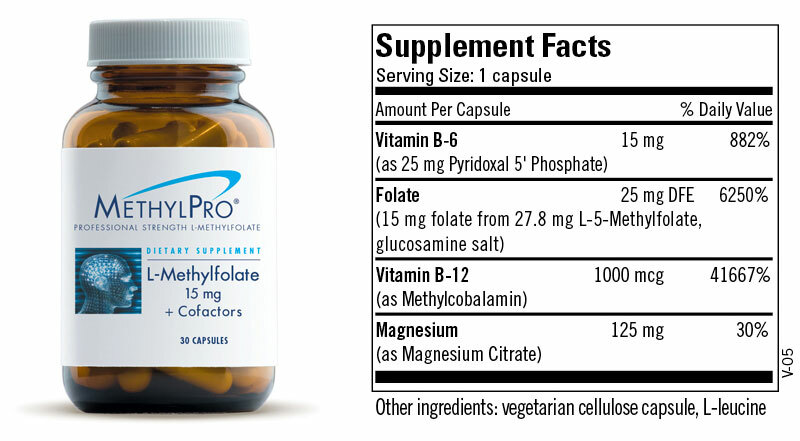 The amount of L-methylfolate per capsule should be higher in the Supplement Facts box than on the front label of the bottle to ensure purity of strength not just the weight value. When a company designs a folate formula, they have to decide what folate “salt” to use. Folate cannot be given by itself, as a single molecule. Folate has to be bound to something else so that it is stable and easy to absorb in the gastrointestinal tract (making it more bioavailable). Manufacturers often use a calcium salt or a glucosamine salt to deliver a superior folate supplement safely and effectively. Both forms deliver the desirable, (S) isomer of folate too. There are different isomers of folate and they don’t do exactly the same thing in the body. In chemistry, stereoisomers are molecules that have the exact same chemical formula but differ in how they are arranged in space. They may look similar to each other, but may have different actions. In the case of folate, the 6(S) or L-5-Methylfolate forms are well absorbed. You should avoid supplements that are labeled as 6(R) or D-5-Methylfolate because they are not biologically active. There should be more L-methylfolate listed in the Supplement Facts than the amount stated on the front label of the bottle. L-Methylfolate is bound to either calcium salt or glucosamine salt, so only part of the total weight is actually active L-methylfolate. Calcium or glucosamine salt makes up the rest of the weight. To meet the label claims, there should be more L-methylfolate per capsule reported in the Supplement Facts. Watch out for companies that show the same amount of L-methylfolate on the bottle’s front label and in the Supplement Facts. You are getting less than the advertised amount because they are not accounting for the weight of the salt in their formulation.